This recipe is taken from Marguerite Patten's Century of British Cooking (Grub Street; £25). Preheat the oven to 160°C/gas 2½ and grease an 18cm round springform tin. To make the pastry, put 150ml water in a pan with the lard. Heat gently until the lard has melted. Sift the flour into a bowl with the salt, add the water and fat and mix thoroughly to a smooth dough. It's essential to keep this pastry warm, or it will crack, so put the bowl over a pan of just-boiled water and cover with a cloth while you continue with the rest of the recipe. Put the ham and chicken leg meat through a mincer or process to a coarse paste in a food processor then mix in the remaining forcemeat ingredients. Cut the chicken breast and the veal for the filling into slices, and then strips. Take two-thirds of the warm pastry, form into a large, flat disc and put in the bottom of the tin. Gently press and mould until the pastry covers the base and sides of the tin, keeping it as even as possible. Put a layer of sliced chicken and veal into the pastry, then add a layer of forcemeat. Continue like this until all the filling and forcemeat is used, making sure you finish with a layer of forcemeat. Moisten the top edges of the pastry with water. Roll out the remaining pastry and cut a circle to fit the top of the tin. Place over the filling and seal the edges, without pressing the pastry down too heavily. Trim the edges. 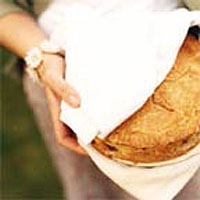 Make a deep slit in the top of the pie and use any pastry trimmings to make pastry leaves. Press these onto the top of the pie and glaze the whole thing with beaten egg. Bake for 2½ hours, lowering the heat slightly after two hours if the pastry is browning too fast. Cool for 10 minutes before removing from the tin. Serve cold.